Dress up like a detective to introduce the theme. Make your own oversized magnifying glass for a special touch. We have prepared a thematic letter for you. 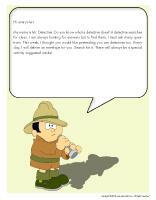 (Open thematic letter-Detectives) Print the letter and place it in a colorful envelope. Leave the envelope in an easy to find location within the daycare. Have children search for it and read portions of the letter to them each day. 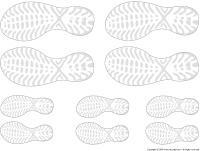 (Open models-footprints) Print and deposit the footprints on the floor, on the walls, etc. Hang magnifying glasses from the ceiling or use them to decorate walls. The pictures may be used as a memory game or to spark a conversation with your group. Use them to decorate your daycare or a specific thematic corner. (Open picture game-Detectives) Print, laminate, and store in a Ziploc bag or in your thematic bin. 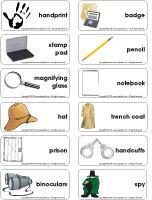 (Open writing activities-D like detective) Print for each child or laminate for use with a dry-erase marker. 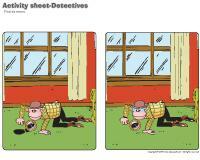 (Open activity sheets-Detectives) Print and follow instructions. Add magnifying glasses to your building blocks. Children can use them to create all kinds of scenes. LEGO blocks can be used to build a police station or a prison. Construction paper, cardboard, and cellophane paper for making magnifying glasses or binoculars. Different shapes of stamps and stamp pads (or poster paint). Light brown or grey cardboard to make a detective's hat. Coloring pages involving detectives and the accessories they use. 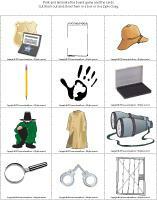 Create your own detective's costume using a trench coat, a hat, a magnifying glass, a notebook, a pen, a walkie-talkie, binoculars, a camera, and handcuffs. Place a stamp pad for fingerprints, numbered cardboard cards for mug shots, paper, crayons, and a typewriter in your area. Memory game using the illustrations from the educatall.com picture game. Observation and hunt and seek games. Laminated illustrations children can trace using dry-erase markers. Explore magnifying glasses! Provide several different objects children can study with all kinds of magnifying glasses. Play music and invite children to walk around the daycare. When the music stops, ask children to lie down on the floor and hide their eyes. Cover a child with a blanket. When you give the signal, children stand up and try to guess who is missing. Blindfold one child. To the sound of music, the other children walk around him. When the music stops, the child wearing the blindfold must guess who is standing in front of him by touching his hands. Children must be very quiet! One child (or yourself) selects a pose (for example, standing with arms raised). The other children observe closely, and then close their eyes for a few minutes. While their eyes are closed, the first child changes his pose somewhat (instead of having his arms raised he could stick out his tongue, for example). When the other children open their eyes, they must identify what has changed. Set up an observation table with several objects related to vision (magnifying glass, binoculars, mirror, colourful cellophane paper). Children can observe a variety of objects using the available tools. Discover your neighborhood! Give each child a magnifying glass and let them observe items found in nature, fences, or anything else which may interest them. Be on the lookout for traffic signs, billboards, etc. Invite children to investigate using magnifying glasses. Provide clues and a list of items children must find. Remember to jot down their observations and comments! (Open family book) Encourage children to question their parents to help them piece together their family history. Parents can write the name of each family member or add a picture in the spaces provided. (Open magnifying glass game-Detectives) Print. Laminate the board game and the cards. Cut them out and store them in a box or plastic bag. Children pick a card and search for the item on the board game, using a magnifying glass. Once they have found the item, they deposit the card in the correct square, on the board game. Deposit sheets of construction paper on a table and place a different object on each sheet. Observe the objects and name them with your group. Ask children to look closely at where each object is located. Invite them to close their eyes and move a few objects around. Children must determine which objects were moved and return them to their starting locations. Collect items you may add to your clothing and deposit them in a separate room. Add one or two items at a time and ask children to find what is different each time you enter the room. Set three opaque drinking glasses on a table and hide a tiny object under a glass. Ask children to follow the glass containing the object with their eyes. Move the glasses around several times. When you are done, children must guess which glass the object is under. 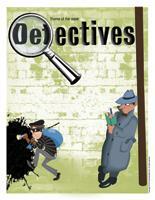 Detectives must be very good at observing! Set several objects on a table. Encourage children to observe them. Cover the objects with a detective's trench coat (or blanket) and remove one object. Children must identify the missing object. Show children several different kitchen utensils or accessories. Blindfold one child and place an object in his hands. Let him manipulate it. Ask him to guess what he is holding. Of course, this game can be done with all kinds of objects. Hide a "treasure" within the daycare. Draw a map and indicate where the treasure is hidden with an "X". Cut the map into five pieces and hide the pieces within the daycare. Divide the group into two teams and have them search for the pieces. Once they have found all the pieces, have them place them correctly to recreate the map and find the treasure! Each child selects a partner. The first child traces a shape or letter on his partner's back. The second child must try to identify it. Search for insects using magnifying glasses, butterfly nets, and tiny exploration containers. You may also use a plastic container. Just punch holes in the lid. Explore bushes, grass, soil, etc. Children will love to observe the insects they find. (Open model-fingerprints) Press children's fingers on a stamp pad and make prints. You can use this activity to show children the name of each finger. (Open model-magnifying glass) Print for each child. Use cardboard for the handle and acetate paper for the glass. Children can use their magnifying glass to pretend they are detectives. Use two empty toilet paper rolls to make binoculars. Let children decorate them. Glue them side by side. Make two small holes on either side of the rolls and thread a piece of string through them. Children will love wearing their binoculars around their neck. (Open detective hat) Print for each child. Let them color and decorate their hat as they wish. Purchase several stamp pads in different colors and a variety of rubber stamps. Let children stamp away on a large piece of white paper to create an original banner. Take a picture of each child dressed up as either a detective or a prisoner. Use cardboard to create an original frame and insert each child's picture. Use washable stamp pads. Ask children to reproduce shapes, drawings, or their fingerprints by pressing their fingers on the stamp pads. Show them how to make pets by using their thumb to print a head, their index for the body, and a marker to draw four tiny lines to represent cat or dog legs. Provide different colors of construction paper. Let each child choose a color and tell them they must draw someone or something which is missing. Display the signs on a wall for parents to see. 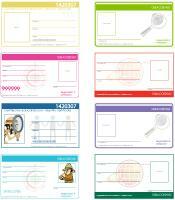 (Open identification cards) Print for each child. Have each child prepare his own identification card to prove that they are real detectives. When they are done, you can add their picture or laminate the card for durability. (Open creative coloring-Detectives) Print for each child. Ask children to draw what they see in the detective's magnifying glass. 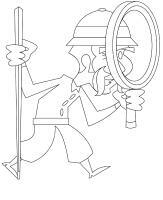 (Open coloring pages theme-Detectives) Print for each child.